Pour 1/4 cup water into the bottom of your slow cooker. Place the ham into the slow cooker with cut side down. Trim the ham if you need to so it fits into your slow cooker. Go ahead and put the ham trimmings in the slow cooker too. Cook the ham on the low temperature setting for 5 to 6 hours or until the internal temperature registers 145 degrees Fahrenheit on a meat thermometer inserted into the thickest part of the ham. In the event you have a programmable slow cooker, go ahead and set it to 145 degrees Fahrenheit. Once the ham reaches 145 degrees Fahrenheit internally, turn slow cooker off. 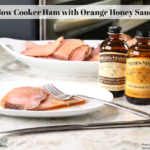 Stir the honey, 1 tablespoon Nielsen-Massey Madagascar Bourbon Pure Vanilla Extract and 1 teaspoon Nielsen-Massey Pure Orange Extract together in a small bowl and pour over the ham; let the ham sit covered with the slow cooker lid for 15 minutes. Remove the ham from slow cooker and set it aside. Carefully pour the juices from the slow cooker into a 1 quart microwave proof container. Microwave on high for 5 to 10 minutes or until the mixture reduces to 1 cup. You can do this on the stove top if you prefer. Stir in the remaining 1 teaspoon Nielsen-Massey Madagascar Bourbon Pure Vanilla Extract and 1/4 teaspoon Nielsen-Massey Pure Orange Extract, then set the sauce aside. Cut the ham into slices and place on serving platter. Pour the orange honey sauce over ham and serve immediately.